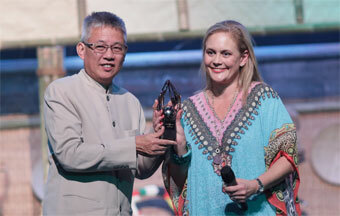 Kuching, Malaysia : Anthony Wong, Group Managing Director of AOS Conventions & Events, was recently awarded the International Congress and Convention Association (ICCA) Moises Shuster Award during the 55th ICCA Congress. Named after one of ICCA’s “founding fathers,” the Award is ICCA’s highest honour, and is given to an individual in recognition of business success as well as for his or her leadership in the international meetings industry. Wong founded the predecessor to AOS Conventions & Events Sdn. Bhd. (AOS) in 1976, and has been a pioneer in developing the Asian meetings market. He is past winner of the Tourism Malaysia's Gold for Best Incentive Program, and has also been awarded "Industry Person of the Year" in the Asia Pacific region by Reed Travel Exhibitions in Melbourne, Australia. He sits on the advisory board of the Malaysia Tourism Promotion Board (MTPB), Ministry of Tourism & Culture. The Alliance has contributed significantly to ICCA: Freysen-Pretorius from South Africa recently won her 2nd term as ICCA President, and other Alliance members were visible at the ICCA Congress, including André Vietor, from Spain, who facilitated an IAPCO session. ICCA is the global community and knowledge hub for the international association meetings industry, and represents over 1,000 member companies and organizations in over 90 countries worldwide. The ICCA Congress, which took place November 13-16 in Kuching, Malaysia, is one of the leading events in the global conference and congress industry.